I'm still thinking I can take on challenges... So I signed up for The Monthly Stich. I think I can do this, though. First, there's one challenge per month, and I don't have to do them all, if I don't have time. Second, the first challenge is for August (the cape challenge), but the next one for September is already announced (vintage pattern). For me the biggest problem with the challenges over the summer were that when I finally got all the supplies, the month had almost gone. 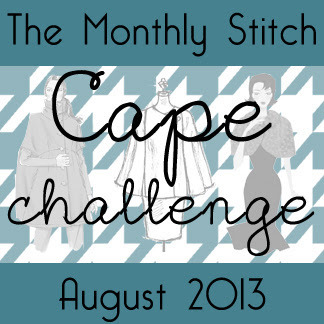 Now, I can make sure I have everything before the month begins and I can actually use the challenge month for sewing. 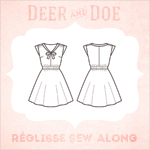 Well, I still have lots of other plans, so we'll see what happens, but at least I've been planning on making a vintage pattern anyway. And I think I have the perfect fabric too. But I got kind of excited about the cape too. Especially since the winters in France don't seem to be that cold, so I could actually wear it at least for the next two winters. I already ordered a pattern, since I pretty much fell in love with the Milano Cape by Papercut Patterns. They also have a lovely cape/jacket pattern: The Watson Jacket, but since it seems to require more skills, I thought I'd try the easier one first. So I guess I'll be fabric shopping on Saturday... I'm thinking of a wool fabric, which would be nice and warm. And maybe a bright color or chocolate brown or leafy green. Pretty much something from my color palette. Anyway, this month, there will hopefully be more posts about actual finished garments and I will finally finish some of the challenges I started, but kind of haven't gotten past the material phase.